What do Guy Sebastian, Ricky Lee, Lisa Mitchell, Wes Dening and Chrissie Swan have in common? They're all former reality television contestants who have managed to stretch their fifteen minutes of fame into a successful career. 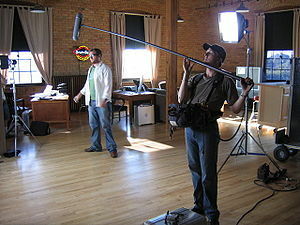 With a little bit of planning and a lot of luck, you too could become a reality TV star. Despite what many viewers might believe, reality television is more about entertainment than reality. So before you show up for auditions, do your research and find out what the producers are looking for in a contestant. You'll need to strike a chord with audiences, either in a positive or negative way. Come up with a hyper-real version of you. Don't lie, but exaggerate the more exciting aspects of your life and don't be afraid to stereotype. Come from a rural town? Then you're the down to earth country bumpkin. Got caught shoplifting when you were a teenager? You're now a former criminal, and you're doing this to turn your life around. Okay, that last one might be a bit over the top, but you get the idea. The former criminal makes for much better television than the suburban nursing student. You should also come up with a strategy. The details will depend on the type of show. For a talent show, you might want to tug at the audiences heart strings with an emotional story about how you began. For a survivor style show, the alliances your form early in the game will be important. In shows where contestants eliminate each other, keeping under the radar is usually a good idea. You'll also need a plan for when the show ends. Although talent isn't wholly necessary to appear on a reality show, it is necessary to keep your career going afterwards. So figure out what you are good at and how you can capitalise on that; common post-reality show careers include radio, television presenting, designing, singing or acting. Now that you've got your character and your plan, how do you get onto the show? Star Now is a free job listing site that provides casting call details for reality TV show opportunities, plus acting, modelling and a variety of other gigs; current vacancies include an audience call for Australia's Funniest Home Videos and participants wanted for Four Weddings. The site lists jobs for all over Australia and is free to join. Reality Ravings is a leading reality television blog that regularly posts casting calls. You can also keep up to date with all the gossip and information from all the Australian and international shows. Otherwise, keep an eye on the website of your favourite shows as audition announcements are often made online.